NEWARK, N.J. (AP) -The New Jersey Devils got a nice four-day break once they returned from a rare trip to Western Canada. Then coach Brent Sutter got them out on the practice rink and made sure any lingering effects wouldn't show up when the Buffalo Sabres came to town. Mike Mottau's first goal since October got New Jersey even late in the third period, and Zach Parise scored the only goal in the shootout, giving the Devils a 2-1 victory over the Sabres on Friday night. The Devils have won three in a row despite scoring just five goals. "We've been home for four days. There'd better not be any jet lag," said forward Patrik Elias, who had a game-high eight shots. "We had a pretty hard practice (Thursday). Any way we'd be sluggish, we got it out of our system." It took a while for New Jersey to figure out a way to solve Sabres goalie Ryan Miller. 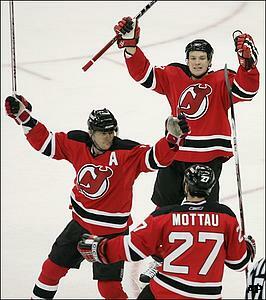 Mottau got him in the third period, and Parise beat him in the shootout. That was enough. Martin Brodeur made a rolling poke-check stop on Ales Kotalik to start the tiebreaker and then denied Tim Connolly and Thomas Vanek to seal the win. "It was a pretty good hockey game considering one team came back to play after not playing for four days and not skating," Sutter said. Miller did all he could to protect a 1-0 lead after Kotalik scored early in the second, but Mottau wrecked the shutout bid with 6:23 left in regulation. He made a right-to-left pass inside the blue line to defense partner Colin White and then cut down low. White's shot caromed off Miller to Mottau, who scored his first goal in 30 games. "It's tough, but Mottau made a nice play," said Miller, after his 10th straight start and 15th consecutive appearance. Miller made 34 saves through overtime and stopped Brian Gionta in the shootout. The Devils spent the final minute of regulation and the first of overtime killing John Madden's delay-of-game penalty. Buffalo earned a point but dropped its second straight following six consecutive wins. The Sabres had won four in a row on the road. "When you have a lead with that amount of time left, it's a point but it's not a good one," Sabres coach Lindy Ruff said. "We had hoped to lock it down, and we didn't." Brodeur, fresh off a 1-0 overtime win at Calgary on Sunday in the Devils' previous game, stopped 26 shots. New Jersey is 14-3-1 in its last 18 games. "I thought I had him tonight," Miller said of Brodeur. "Both of us were making some saves. He got on a couple of rebounds we probably would want back, but that's the way it goes when you play New Jersey." The tide turned in the second when the Sabres, playing for the fourth time in eight days, picked up the pace in the New Jersey end. After recording a season-low two shots in the first, Buffalo grabbed the lead with their sixth shot, taken from a tough angle by Kotalik at 4:36. Daniel Paille jarred the puck free along the left-wing boards with a hit that sent the 6-foot-4 White to the ice. The puck swung to the opposite side to Kotalik, who wound up between the top of the right circle and the boards and sent a shot off the left post and in behind Brodeur for his 12th goal and third in four games. Except for that, Brodeur handled the action he didn't get in the first. Buffalo caught up dramatically in shots with a 13-6 edge, but didn't take advantage of a pair of power plays awarded about two minutes apart. "In the third, I thought we played well again," Elias said. "We wanted to get one point or two points. We went after it, and ... big win." The Devils looked fresh in their first period after going 2-1 on the trip that ended last Sunday. After falling 5-0 to Vancouver, the Devils beat Edmonton and Calgary by a combined 4-1 score - including Brodeur's 95th regular-season shutout, second most in NHL history. New Jersey dominated the opening 20 minutes, keeping constant pressure on Miller and outshooting the Sabres 13-2. Most of the chances were generated by the top line of Elias, Dainius Zubrus and Gionta, a trio that recorded seven shots - four by Elias. Miller stood up to the challenges, and even turned aside Arron Asham's penalty shot with 3:34 left in the period. "The last 10 minutes of the first was all theirs, and I really thought the second period was all ours," Ruff said. "We sat on it a little bit in the third period, but still it's a defensive game we knew we'd be in. We thought we could get through it." Notes: Buffalo RW Drew Stafford missed his first game due to a concussion sustained Wednesday. Clarke MacArthur was recalled from Rochester (AHL) and replaced him in the lineup. ... Devils D Karel Rachunek (ankle) sat out his second straight. ... Mottau scored his other goal this season on Oct. 6 at Florida in New Jersey's second game. ... Parise sat out on Sunday with the flu.